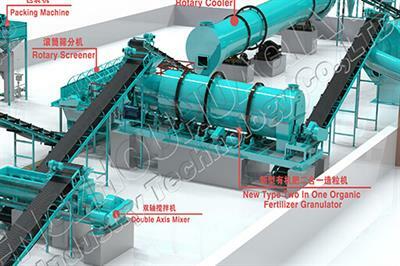 High-output bio-fertilizer production line is the professional organic fertilizer processing plant manufactured by the world-class brand Zhengzhou Huaqiang Heavy Industry. Bio-fertilizers can not only increase crop production, but also improve the quality of agricultural products and reduce the amount of chemical fertilizer, which plays an important role in sustainable development of agriculture. The organic fertilizer from the livestock and poultry manure has the comprehensive nutrients, low cost and high profits, wide and available raw materials. Here we take the pig manure as the raw materials to process the bio-organic fertilizer by 80,000 tons bio-organic fertilizer production line annual output. 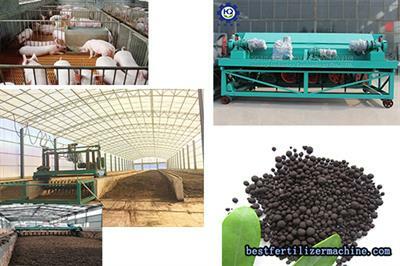 The bio-organic fertilizer production line is a complete set of bio fertilizer production process that uses fresh livestock and polutry manure as raw material and produces a series of natural organic pig manure fertilizer through a series of processing. 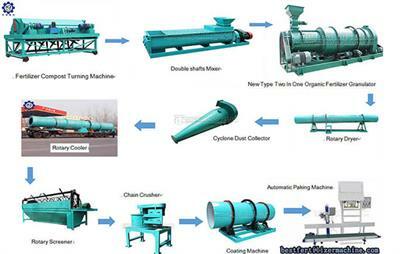 Processing organic fertilizers needs two steps: fermentation process and granulation: Hydraulic type groove turning machine, fertilizer crushers, horizontal mixer, new type organic fertilizer granulator, rotary dryers, coolers, screens, packing machines, belt conveyors and other equipment. all these equipments are meeting the demeands of environmental protection and low cost, energy-saving, high output and high economy. 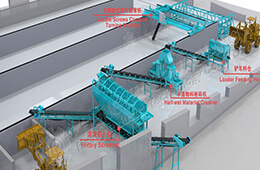 5.Drying /cooling processThe drying process is an indispensable and important process in the process of fertilizer production, which directly affects the output, quality and energy consumption. Because the moisture content of the particles after granulation is generally between 15% ~ 20%, because the fertilizer quality index of moisture content requires less than 14% , so it which needs low temperature drying treatment with rotary dryer.